A self proclaimed purveyor of Japes, Cheap Tricks and Minor Amazements Master Payne has been delighting audiences in theatres and hotel banquet rooms in locales from Guam to London. He is also a sought after speaker and performer for conferences devoted to the Art and Craft of Magic as well as being the writer of books, articles, and at one time a monthly column on the practice and performance of the magical arts. 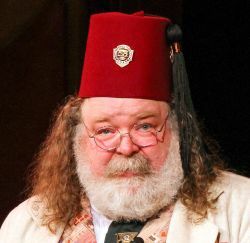 He is a speaker at Jeff McBride’s Mystery School in Las Vegas and in recent years he has appeared at the World Famous Magic Castle in Hollywood California.